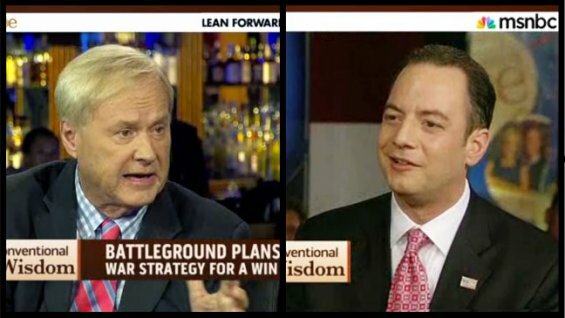 (HuffingtonPost) -- Chris Matthews exploded at Reince Priebus on Monday's "Morning Joe," tearing into the Republican National Committee chairman and accusing his party of playing the race card. Priebus spoke out about the confrontation later in the day. The MSNBC host was livid over Mitt Romney's recent birth certificate joke, and false claims that Obama ended work requirements for welfare. "That cheap shot ... was awful," Matthews said, referring to the joke. "It is an embarrassment to your party to play that card ... you are playing that ethnic card there." As Priebus apparently laughed and co-host Joe Scarborough tried to get a word in, Matthews continued, "you can sit there and giggle about it, but the fact is your party is playing that card." "You think Mitt Romney's playing the race card?" Scarborough asked. "There's no doubt he did," Matthews said. Co-host Mika Brzezinski speculated that Romney may have said what he said because he is an "awkward joker." Priebus said Matthews was just trying to "push his brand" with his "monologue." "It just seems funny that the first joke he ever told in his life was about Obama's birth certificate," Matthews said. Later when Priebus alleged that Obama was looking at European policies for guidance, Matthews lost it again. "Where do you get this from?" Matthews shouted. "This is insane." He charged that Priebus was "playing that card again." "Let's just work on tone," Brzezinski said. "Chris, let him answer the question," Scarborough said. "I'm not going to get into a shouting match with Chris so you guys can move on," Priebus said. "Because you're losing, that's why," Matthews said. "Garbage, garbage," Priebus muttered. "It's your garbage," Matthews fired back. In an emotional interview with POLITICO tonight, MSNBC host Chris Matthews defended his spirited attack against RNC Chairman Reince Priebus, in which he alleged that the Republican party was guilty of playing the race card against President Barack Obama. "It is obvious that this is something I care passionately about: race was abused by white politicians in my lifetime, including Reagan. For someone to come on the program and deny that this is part of their process, I couldn't take that," Matthews said. "This is something I really, deeply believe in. We grew up in a country where appeals to race have been awful, terrible. This language -- we are beyond this. It had to be called out."